MPM 1/72 A-20G Havoc "South West Pacific Warrior"
KIT: MPM 1/72 A-20G Havoc "South West Pacific Warrior"
The Douglas DB-7/A-20 Havoc was the most-produced attack bomber during World War II. A total of 7,477 DB-7/A-20s were built, most at Douglas, although 380 were built at the Boeing plant in Seattle, Wash. The Havoc was a mid-wing, twin-engine, three-place medium bomber that earned a reputation for getting its crews home, even when both crew and aircraft suffered crippling blows. It was called the "Boston" when it was built for England's Royal Air Force. It entered production when, despite official neutrality in 1938, there was little doubt in the United States that the country should support its allies, Britain and France. The French saw the secret bomber project at the Douglas Santa Monica, Calif., facility and ordered the first 107 DB-7s; they were to be delivered to the French Purchasing Commission at Santa Monica starting in October, with deliveries made by ship to Casablanca. The French then ordered another 270 DB-7s. Before the fall of France in June 1940, half had been accepted, but many were still en route. Sixteen had been diverted to Belgium's Aviation Militaire. The United Kingdom took over 162 of the DB-7s intended for France as well as Belgium, which also had fallen. By the time the United States entered World War II at the end of 1941, British Havocs and Bostons had already performed well for most of the year against German targets in North Africa and Southern Europe. The U.S. Army Air Corps designated the plane the A-20 Havoc, and it served in every theater of the war. More than half of the DB-7/A-20s built went into service in other countries, predominantly the Soviet Union. Versions also included the F-3 photo reconnaissance aircraft and the P-70 night fighter. 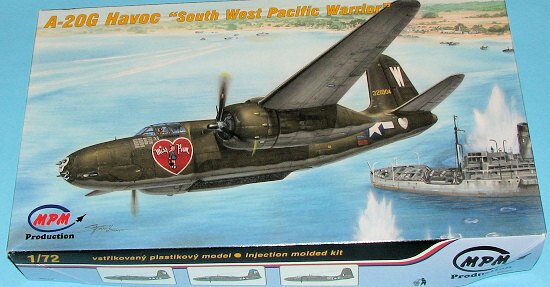 The A-20G, and subject of this kit, was delivered from February 1943, and would be the most produced of all the series - 2850 were built. The glazed nose was replaced by a solid nose containing four 20 mm cannon and two 0.50 in (12.7 mm) Colt-Browning machine guns, making the aircraft slightly longer than previous versions. After the first batch of 250 the unreliable cannon were replaced by more machine guns. Some had a wider fuselage to accommodate a power driven gun turret. Many A-20Gs were delivered to the Soviet Union. The powerplant was the 1,600 hp (1,200 kW) R-2600-23. US A-20Gs were used on low-level sorties in the New Guinea theatre. Many have been wondering when someone would do a new mold A-20. In the past we have had fairly nice, but old kits from Revell for the A-20C and Matchbox for the A-20G. We were delighted when AMT came out with a series in 1/48 before they stopped doing aircraft kits back in the late 1990s. Now we have the first of what is undoubtedly going to be a series of these aircraft in 1/72 scale. The breakdown of the kit is such that it is obvious that MPM is planning on other version. So let us take a look at what is provided. Starting in the cockpit, we have a nicely done section with raised panel detail on the instrument panel, a set of rudder pedals, control wheel and a rather generic seat without belts. MPM made the same error as did AMT and did not supply a life raft for the compartment behind the pilot. This is something ALL planes operating in the SWPA would have carried. There are inserts for the sides of the cockpit for panels. One will need to be trimmed to fit and that is shown. Engines are built up out of a pair of rather generic looking cylinder banks with a gear housing fitting on the front. The nacelles have some interior detailing to them for the supercharger coolant scoops. The large intake scoops atop the wings are the only parts on my kit that showed any sort of sink marks. Easy to fix, but it will also fill in some detail. 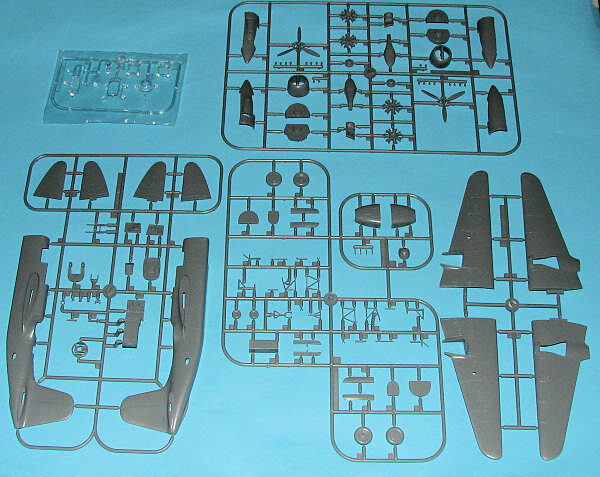 The parts layout shows ejector stacks for the lower cowling as does the box art (though the patterns are different ). However, the instructions omit any mention of installing them and give no placement guide. I should mention that the inside of the engine nacelles show nicely done exhaust pipes, complete with the ends partially drilled out. Time to head for the references on this one. The nose section is three pieces and provides plenty of room for nose weight. Guns are best installed after painting and decals. Landing gear are quite scale appearing and are a rather complex assembly. One will have to take care while constructing this section. Once the gear are attached the lower wing, the nacelles are glued on. This is after the wings are glued in place. Well, I'm sure most of us will alter that construction sequence some to be sure to get all the engine and nacelle seams properly taken care of. Clear bits are particularly nicely done with the upper hatch section molded separately to show the bare life raft compartment and the cockpit. I also found it interesting that there is no pretense for allowing spinning props. One just glues them in place in the final construction assembly! OK, so we know the instructions have a glitch when it comes to the exhaust, but the rest of it looks to be well drawn with a few detail drawings as well. Gunze paints are recommended though generic color references are provided. The Aviprint decals are very nicely done and give markings for three OD over Neutral Grey planes. All seem to have Medium Green splotches on the edges of the wings and horizontal stabs. The painting and markings guide is printed on slick paper in full color. 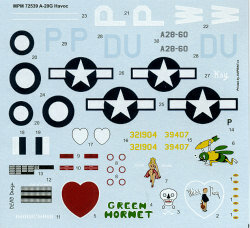 One option is the box art plane from the 312 BG in Hollandia during 1944, Next is the popular 'Green Hornet' of the 417 BG in Saidor, also during 1944. To add an international flavor an Australian A-20 of 22 Squadron is provided, also with nice nose art. So there you have it. A proper, modern mold 1/72 A-20G Havoc. Sure, there is a glitch or two, but nothing that most of us would be really concerned about. I'm sure that there are more to come so stay tuned. As a final note, I'm glad to see this kit is in a real box with a separate top. Having the top stapled vice glued with weak cement is a plus as well.